Nobody wants to spend money on low quality tools. Good tools are an investment for a long time, therefore time to enjoy this set of insets. Cheap tools wear quickly and therefore damage the screws, annoyance everywhere! With this set we give you a lifetime warranty on wear! So when you wear one of these pins, we replace it for free! TPS TruTorque socket pins are manufactured from high-quality HSS steel for durability and long life. The precision ground ends ensure an exceptionally good fit. 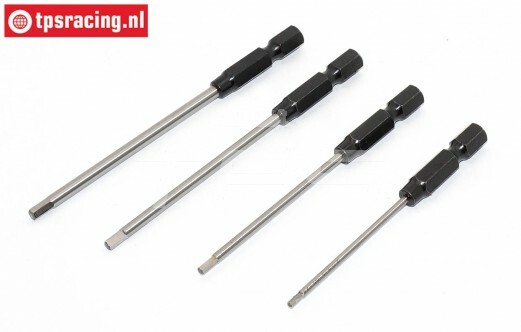 The ends are provided with a 1/4 inch, or 6.3 mm hex, so that it fits all standard tools and bith holders. When it comes to high quality products, you are also at the right address with this set at TPS Racing. Ideal in use with our Magnetic bit holder. TPS648/10 Fixing Adhesive Green 10 ml, 1 pc. TPS243/10 Treadlocking Medium Bleu 10 ml, 1 pc. FG6833/10 Bits insert Torx TX10, 1 pc. FG6832/05 Bits insert wrench 5,0-L70 mm, 1 pc. FG6832/03 Bits insert wrench 3,0-L70 mm, 1 st.